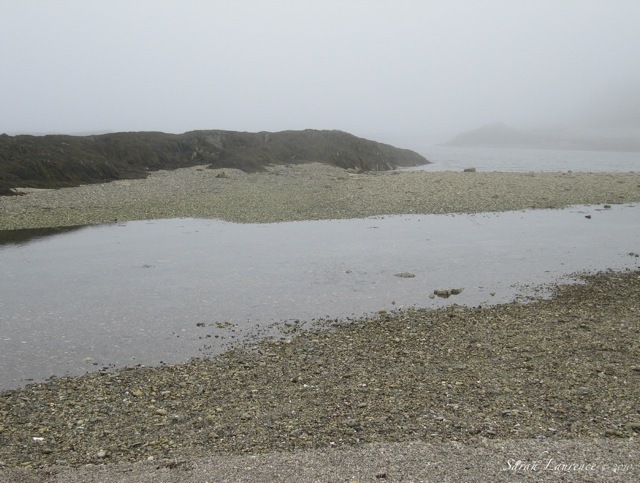 An island hides in fog as the tide ebbs and flows. 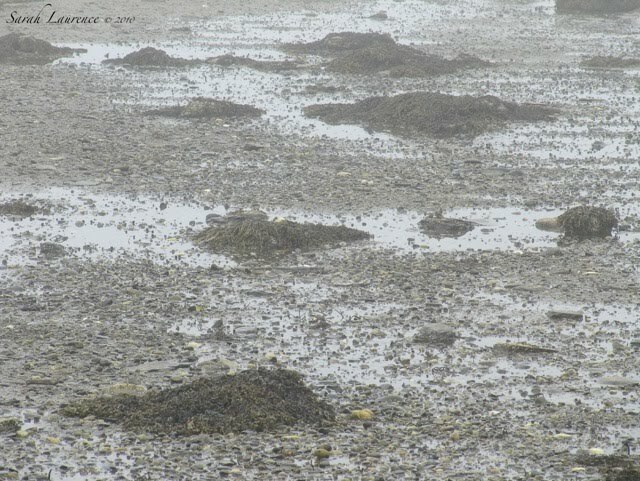 Murk, mud, shells, seaweed and pebbles emerge from shoals. Tidal pools harbor hermit crabs, tickling toes. An offshore storm swallows the shore. Thunder moans. Magazine watch: I sold a couple of my landscape photographs to a new magazine, Mainely Spirits. 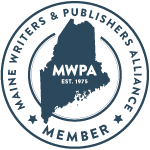 If you’re in Maine in August, pick up a free copy at stores (including supermarkets) that sell liquor. Through these photos I can smell the air, and my nose knows the difference between high and low tide (I like both). I can hear the quiet of water lapping punctuated by the occasional bird. Thanks for the linkage. Great photographs, Sarah! That first one would look stunning applied to canvas. Congrats on your sale. Was it one of these pics? I can almost imagine I am there! I miss it! Perfect colours for a bedroom. 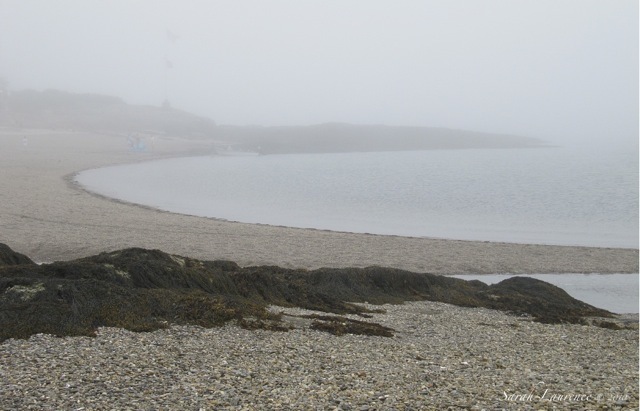 Thanks for discovering the island's fog-time secrets for us, Sarah. What a beautiful poem! And congratulations on the sale of your photos. 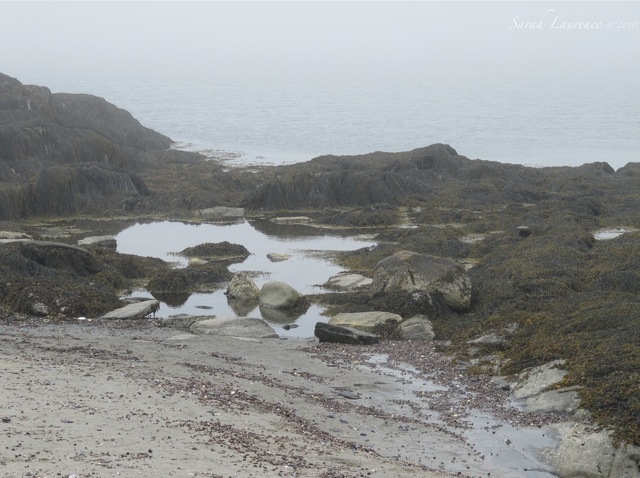 Dear Sarah, You have, I am certain, captured the very essence of Bailey Island with these atmospheric images. The tints and tones of blue and grey are so very lovely and, throughout, there is, as you say, the moan of the sea. On a completely separate note, I did obtain the Sarah Waters' novel about which you wrote and which I enjoyed very much. Upon reflection I was left feeling slightly disappointed as, although set immediately after the Second World War, the style tended to resonate of the C19 which, for me, made the characters and events of the late 1940s not quite ring true. And I'm fortunate to say I've seen sights like that with my own eyes. and a poet's soul in the captions. Sarah, your photos are so dreamy. I wish, I wish, I WISH I were there. I just finished "Remarkable Creatures" and am still in a rocky shore mindset. Les, you are right about how different the seaside smells as the tide turns. It was unusually quiet. I think the birds knew the storm was coming. We had tornadoes that night! Bonnie, I’ve never thought of printing my photos on canvas, but you are right that the painterly quality in the first one would lend itself well to canvas. I often take photos that look like paintings and paint watercolors that look like photos. The sale photos were from my Morse Mountain posts. It was for an article on Off the Beaten Path in Maine. Tina, Maine misses you too! Pamela, you have the decorator’s eye. W2W, the fog is like a secret, nicely worded. Edith, Sarah Waters’s earlier novels were set in Victorian times so perhaps that was the cause of the anachronisms you noticed. I’m glad to hear you enjoyed The Little Stranger nonetheless, and thanks so much for sharing your reaction with us. David, I recall you’ve had some foggy days in Maine too. Amanda, thank you – high praise indeed! JAPRA, I wish we could have shared the day with you too. I get the feeling that my daughter and yours would enjoy each other. Remarkable Creature is on my wish list. It was exciting to sell some of my landscape photos. All, sorry, I’m behind on blog visits. The fog lifted; the sea calls me! And I'm writing up a storm. I love that kind of weather. These moody grays are so soothing to look at in late-summer. A tonic, really. I am hoping to visit Lyme Regis later in the summer . . . and I can't help but hope that there's fog. Congratulations on your photography coup! Donna and Delwyn, foggy days are good for photography although not as good for sunbathing. I’m glad I’ve had a mix of both this summer. Bee, do share your photos of Lyme Regis. I’ve never been. Thunder moans! I love that line. The photographs conjure up Wuthering Heights for me...the somewhat dark and foreboding atmosphere. Stirring. Beautiful. Mama Shujaa, the novel I read in Quebec was Wuthering Heights! I read it years ago as a teenager and wanted to revisit it. My vacation was to read a book not for review. It did have a fabulous sense of place, so thank you! I think I'll be a beachcomber in my next life. How mysterious! I'm writing up a foggy storm too. Gorgeous pics.. I want to be there. :) Congrats! I think I like the shore almost as much without a brilliant sun. So happy to hear about your photos. Reading this blog entry, I've rediscovered that fog is something to take us to a new interesting sphere. PS I enjoyed reading your previous post. Québec City is really romantic and beautiful! All, Mainely Spirits doesn’t appear to be at Hannafords Supermarket in Brunswick. I’ll check elsewhere. Troutbirder, I like beachcombing for sea glass and natural treasures. Cynthia, nothing beats sundowners in Maine. Keri, I wish you were here too. Elizabeth, I like the variation in weather. Beautiful poetic post ... through your words and images. Lovely mood I could walk into. Carol, thank you! I love what you said about walking into the mood.